← 438 "Father Knows Worst"
The Simpson's are in Ancient Greece, then Bart catches a warriors head. "Waverly Hills 9-0-2-1-Doh" is the nineteenth episode of season 20. It originally aired on May 3, 2009. It guest stars Ellen Page and Maurice LaMarche. "When Marge discovers the poor teaching conditions at Springfield Elementary School, she gets Homer to rent an apartment in the Waverly Hills area so Bart and Lisa can attend school there, but Lisa's lack of knowledge about singer Alaska Nebraska makes her as unpopular as ever, until Bart spreads a rumor that Lisa and Alaska are best friends – which comes back to haunt Lisa when her new friends want backstage passes to her upcoming concert; Homer has to stay in his shabby apartment until the city's inspector pays a surprise visit to make sure they actually live in the area, but he gets to like it – until he invites Marge to move in with him." Marge is out jogging one morning and discovers a booth offering free samples of sciencewater. After consuming too many free samples, she desperately searches for a public toilet to 'go' in. Eventually, she uses one in Springfield Elementary. Afterwards, she walks through the halls and is appalled to discover that Springfield Elementary is the worst school in the state, replete with apathetic teachers and overcrowded classrooms. Marge and Homer, concerned for their children's future, decide to rent an apartment in the upscale Waverly Hills school district so Bart and Lisa can attend a better school, although Homer makes sure that he rents the cheapest apartment available, even going as far as to specify that he wants the worst apartment in the worst part of town, the cheaper the better, and eventually picks a room where the bed comes out of a wall and barely even gets down to the other floor, and the bathroom is in an Ethiopian restaurant all the way at the end of the block. Bart and Lisa are thrilled at the prospect of a fresh start. Bart, eager to establish his reputation as a "bad boy," is shackled and led away by Chief Wiggum, leaving the other students in awe. Once away from Waverly Hills Elementary, though, it is revealed that Chief Wiggum "arrested" Bart as a favor, if Bart promises to attend Ralph Wiggum's birthday party. Meanwhile, Lisa is having difficulty making friends. Bart, noticing his sister's gloomy mood, lies to several popular school girls that Lisa is a friend of an immensely popular teen singer named Alaska Nebraska (voiced by Ellen Page). Marge and Homer learn that they will be visited by a city inspector to confirm that the Waverly Hills apartment is indeed the residence of Bart and Lisa, so Homer moves in and befriends two college boys. Homer adopts a bachelor lifestyle, playing videogames and attending parties with his newfound college friends, and he and Marge begin to act as though they were newly dating. 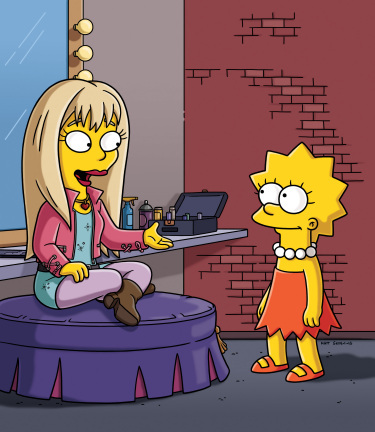 Lisa has become popular with several of her classmates, but only because they want backstage passes to an upcoming Alaska Nebraska concert. Lisa sneaks into Alaska's dressing room and pleads her case, but Alaska is unsympathetic and Lisa is removed from the venue by security. She admits to her fair-weather friends that she was not Alaska Nebraska's friend, and the girls chase her away. Meanwhile, the ominous inspector visits Homer's Waverly Hills apartment. Homer and Marge frantically lay out toys and Krusty the Clown dolls in an effort to convince the inspector that the children live there. He concludes that the apartment is the residence of the Simpson children, but admits that he was "hoping to kill them and make it look like a suicide." Bart and Lisa, however, plead to return to Springfield Elementary. Lisa in particular wishes to return, because she would rather "be ostracized for who I am, not who I pretend to be." Marge and Homer concur, but wistfully state that they will miss their "love nest" apartment. The episode concludes with Homer and Marge using the backyard treehouse as their new love nest, much to Bart's chagrin. In its original broadcast, the episode received a total of 6.75 millions of viewers making it the most-watched Fox show of the night. Robert Canning of IGN gave the episode a 8.8/10 calling it the best episode in season 20. Modified on July 16, 2017, at 02:09.